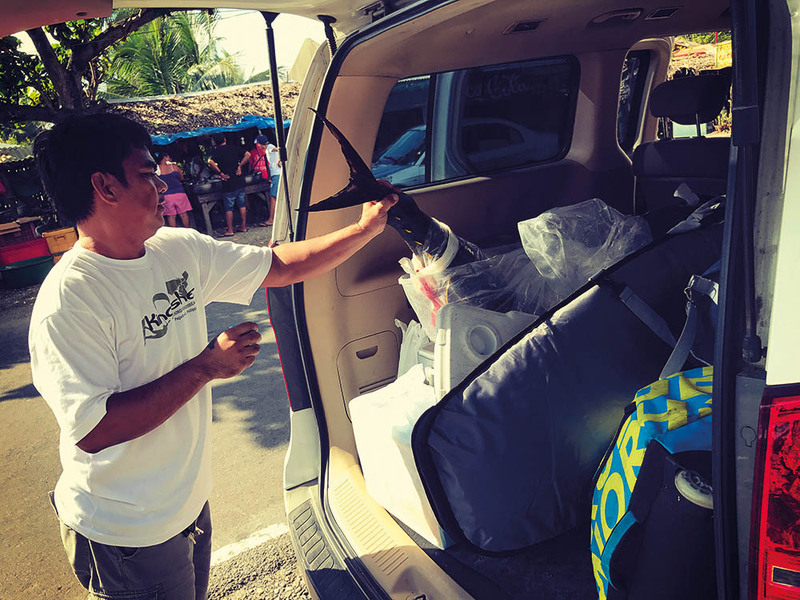 Landing into Laoag, the transfer to my awaiting shuttle for Kingfisher Resort was painless. A nice comfy air con van with ample leg room and a friendly bus driver is always a welcome treat after a long flight. 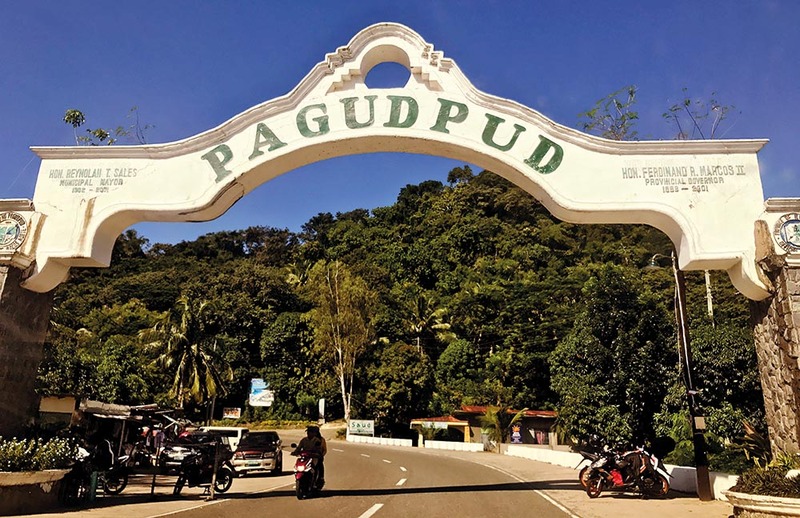 After a two-hour trip through tropical villages, with a stop off for some coldies at the grocery store and a massive tuna from the fish monger, we finally arrived at Pagudpud and shortly after, Kingfisher Resort. 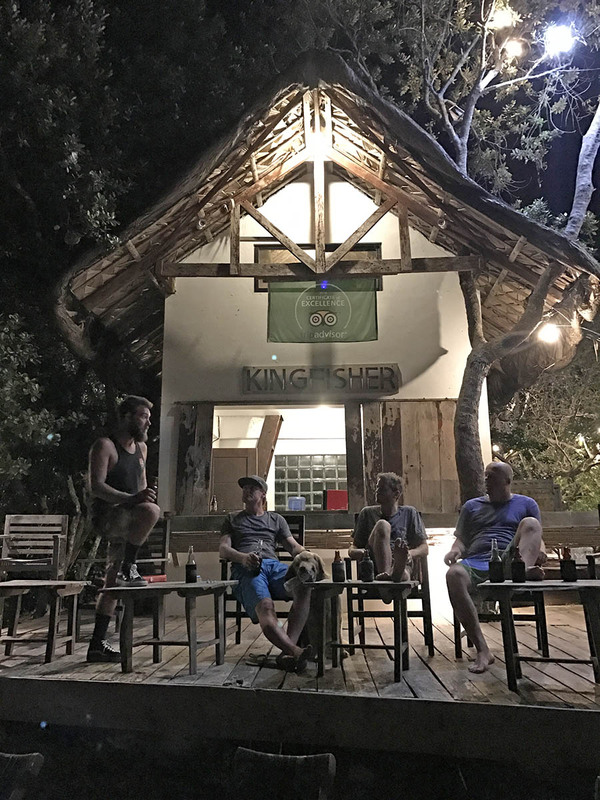 Kingfisher Resort is a very laid back, simple, comfortable and clean hideaway, perfectly setup for the travelling kitesurfer. 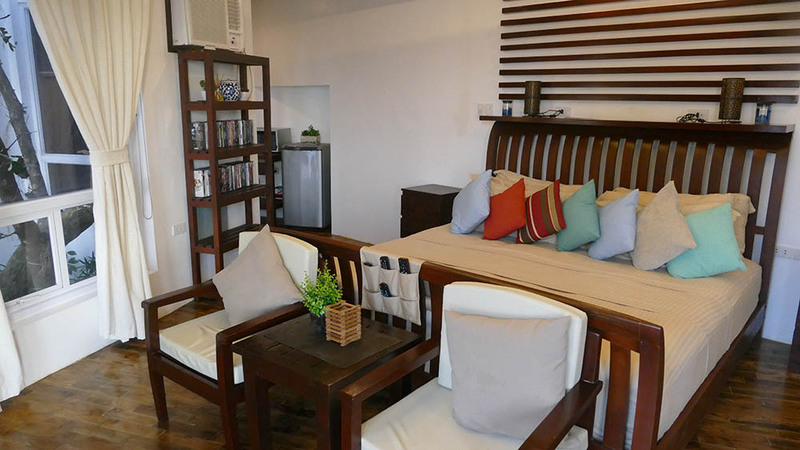 There are several different options for accommodation ranging from super cheap ($20-$300US) for a little beach shack dorm bed, right up to your own penthouse with private pool. I was super lucky to score what they called the Casita Suite, which was pretty damn luxurious by my standards! Definitely super comfy to take the most fussy of girlfriends, although the water in the showers is bore water, so make sure you educate your missus on that one. The food at Kingfisher is something the owner Mon prides himself on and it was exceptional. Mon helps serve it up, and has a big smile from ear to ear every time a guest compliments him on the food and service. During Kite Week, they had a buffet running. Usually, they run a standard restaurant setup, which is also very good and, of course, cheap. 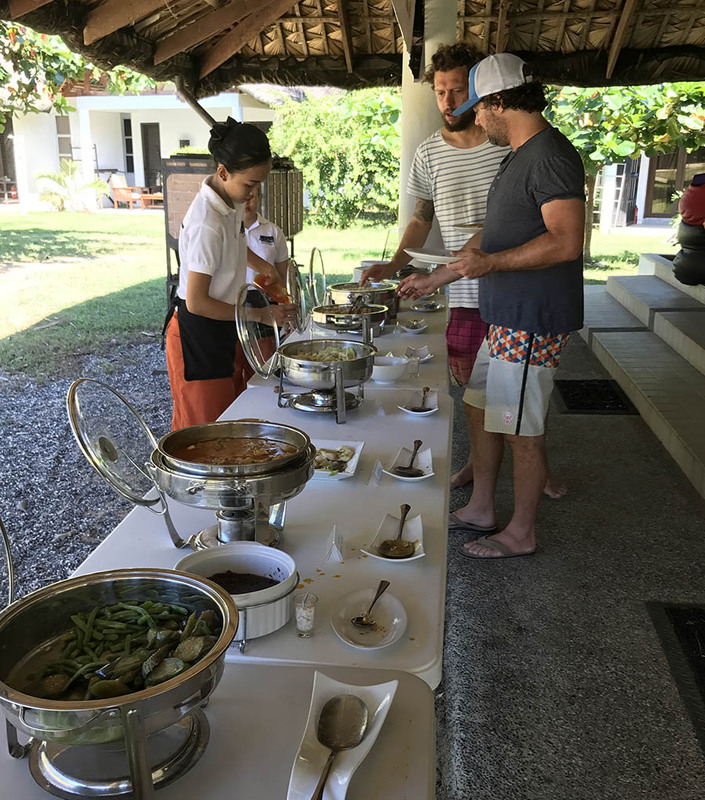 All the extras like food, drinks, massages are kept at local prices, which makes the whole week very good value. That’s in comparison to other resorts in tropical locations where they charge their customers $120 for a massage but pay a local $2 an hour to work. That’s just rude! So it’s refreshing to see this approach and much appreciated for a poor starving artist like myself. There’s a sweet bar setup right on the beach, and $2 beers and $5 cocktails always go down a treat after a full day on the water. You could take your partner/family along on this trip but be warned – if they don’t kitesurf you might create a wedge because it’s windy…a lot. You will be kiting most of the days! 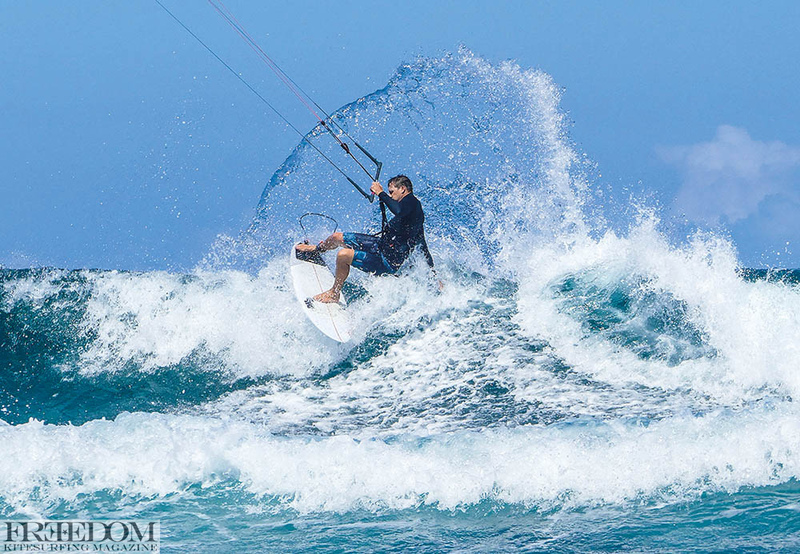 This particular week was Kite Week for BWS so there was a good crew of 30 or so kiters from around the world, plus the well known rippers Ben Wilson and Ian Alldredge offering up daily tutorials and shred demos. 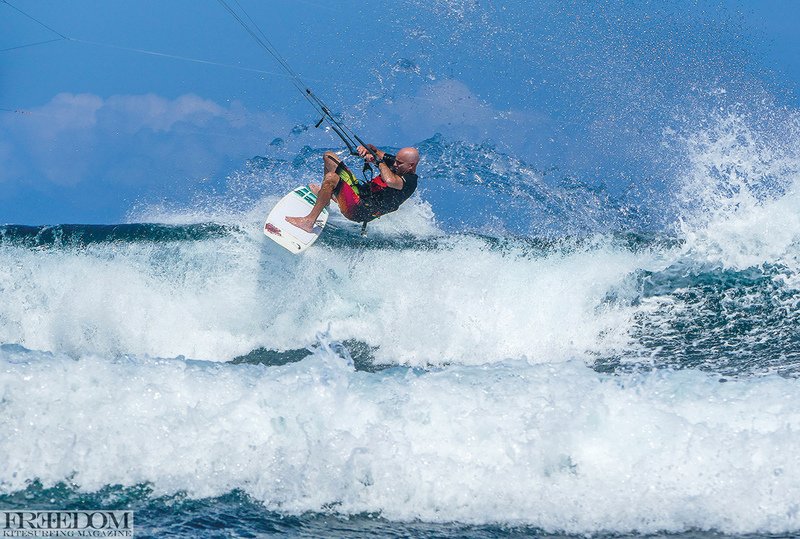 BWS Kite week at Kingfisher is an awesome time to go to learn with the pros and connect with riders from all over the world. Plus, you get to shred it up in front of a cameraman (which was myself on this particular trip) so the fodder for the ‘there’s one for the grandkids’ is awesome. This particular week there was some really good talent on the trip. Not just the mighty Ian Alldredge, Ben Wilson and Matt Tobin but the guests themselves were absolutely ripping. 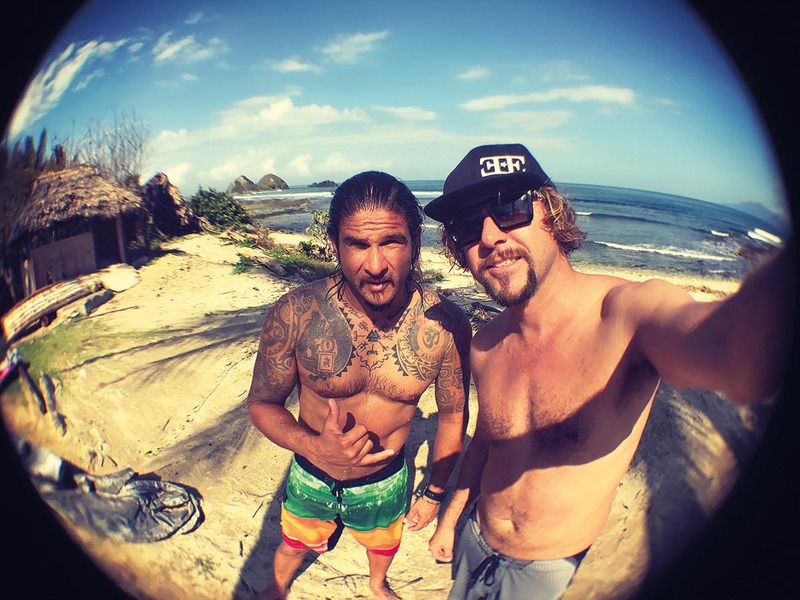 The Shredder-of-the-Trip Award goes to Olivier with this sick fins out reo pic! This was a challenging shoot for me, as without a water-housing it was hard to get close to the action from the shore, with a lot of salt haze spoiling most shots. I managed to talk two local lads into floating an A-frame ladder on a kayak out onto the reef and standing on the base of it in 2ft of breakers. This kept the ladder steady while I was free from the water and could focus on shooting. I got some really good shots super close to the wave. I took a Neil Pryde dry bag out with me, which I wore on my front and used this to hide the camera every time a splashy, bigger wave rolled through. The whole setup worked a treat! Nailed this rad shot of Ian Alldredge! 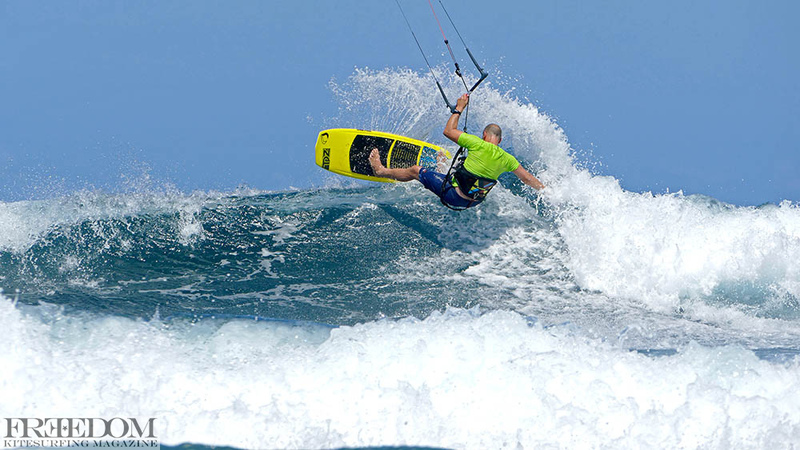 You don’t have to go on a Kite Week, you can go anytime, with a long season from September right through to March. The wind is generally very consistent with strong 20-25 knot days most days. There’s a complete kite store right at the resort run by friendly Spanish hombre Raz, who offers up gear hire, lessons, rescues, kite setups, guides to other locations…the works. I was here for almost three weeks and out of that I only had maybe four days of no wind. On the days with no wind there is still plenty to do with great surfing, supping, snorkelling, waterfall exploring, local markets, the world’s biggest zip line (well it looks massive!) and plenty of hammock swaying to be had. It’s warm, so I didn’t need a wetty top at all, but booties are a must with lots of reefy sections, which is fine on high tide but sketchy on low tide. I found the spot right where the resort is to be a very consistent, fun, wedgy skate park-type setup. Most days were relatively small wind swell with a few bigger days and a handful of giant “oh my god I’m going to die” days but, all in all, a very fun spot with good consistent wind on the wave right up to the shore line. 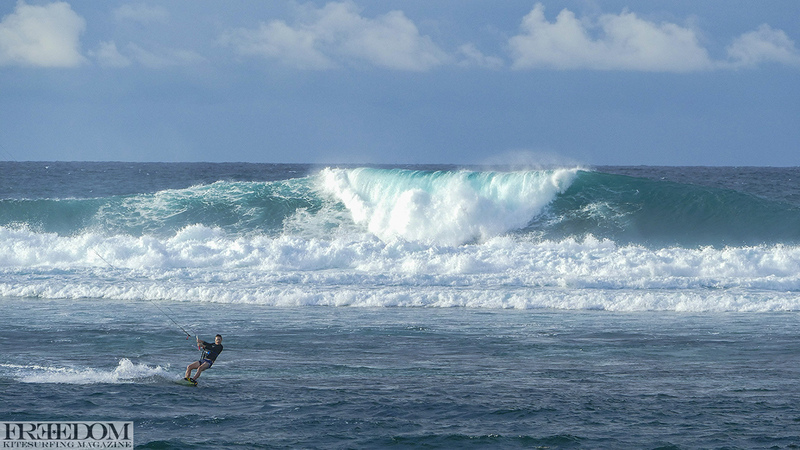 The waves (being over reef) manage to stay pretty clean even in 25 knots. Staying upwind was easy with little water moving around on most days. 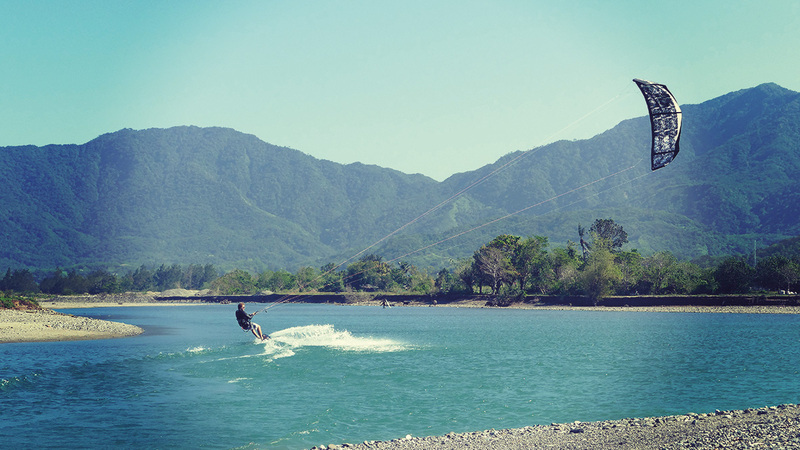 For flatwater kiting, there is a lagoon in front of the resort before the waves. For ultimate flatwater, I suggest a road trip south where you will find a few primo spots. Raz in the shop will give you a heads up on where to explore, or he will eagerly show you himself. 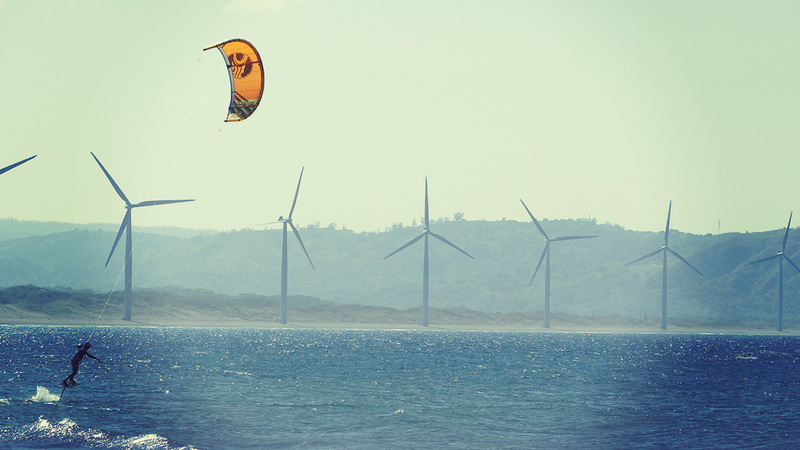 Kingfisher and the local town of Pagudpud is a very nice place to spend some summer kite action days. 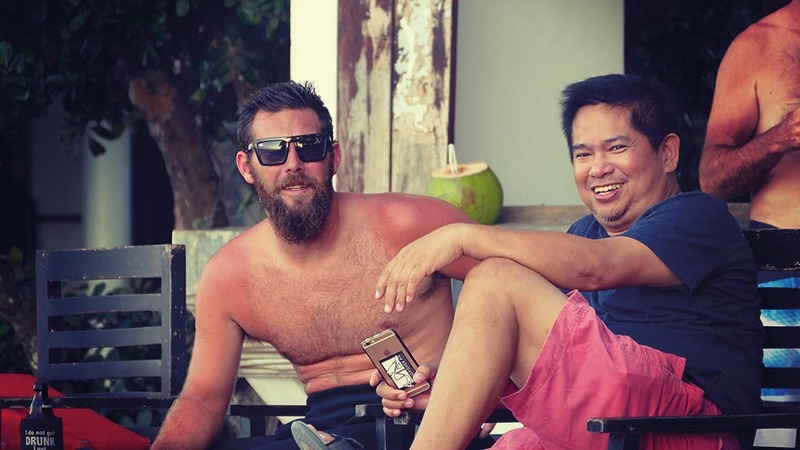 The locals are friendly and don’t hassle you to buy stuff, there are no problems with sharks, the seafood kicks arse, massages are $10 and a bottle of local rum (Tanduay) will cost you only $5 over the bar. Be warned – the hangover is hectic! There are no malls or megaclubs like Bali, but that’s what is nice about the place, it’s just super chilled and not over developed (yet!). There are some other nice beach bars you should check out, one is Choccos Bar, which is only 10 minutes from Kingfisher. There’s a good SUP / mal wave out the front here and cheap drinks once you’re done, with a super hospitable manager, Archie, willing to party with you at the drop of a hat. Tell us about your shop here on location? 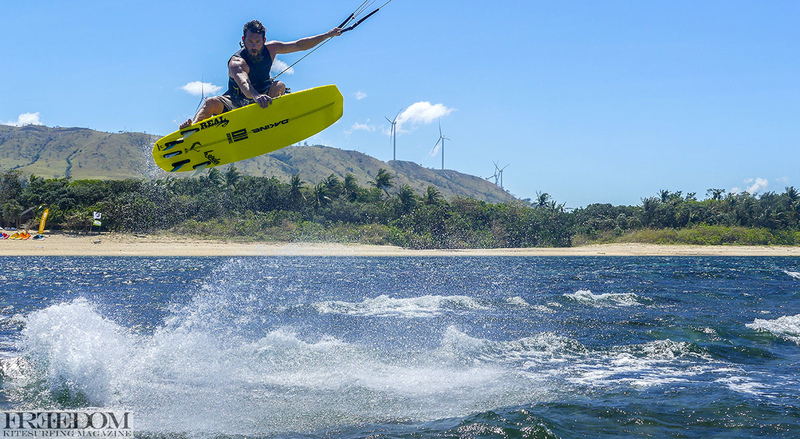 Here at GreenYard Pro Center at Kingfisher, we at an official Cabrinha kiteboarding center. 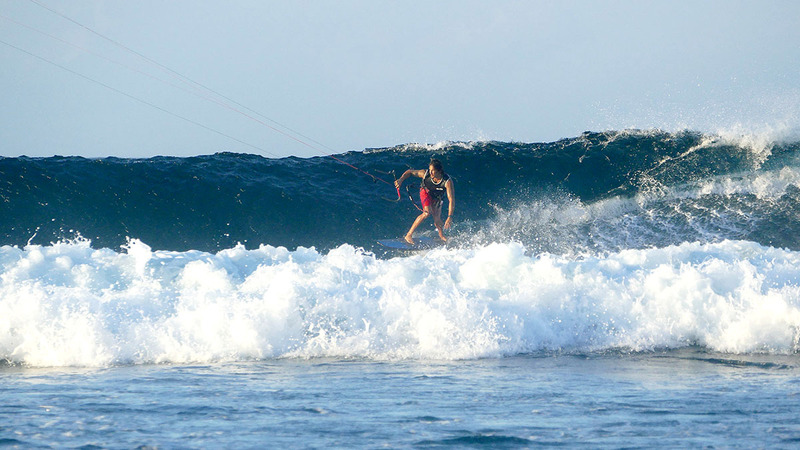 We offer sales and rentals at one of the Philippines’ most exclusive Kite spot. We are also very fortunate to have DSD Intel products here, including amazing kites and boards from the only kite factory here in the Philippines. In fact, it’s somewhat of a R&D center as well and many new designs and concepts are born here. 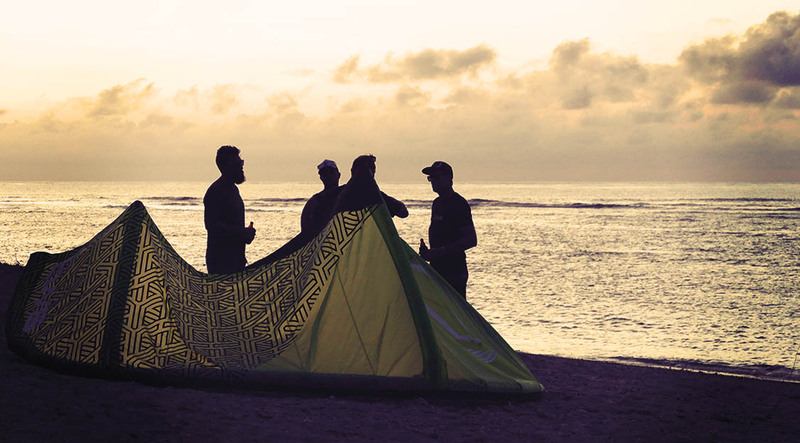 The entire range of ILokano WaterSports kites and boards were born right here at Kingfisher and GreenYard. Also, we do surf, windsurf and SUP related activities too. Whats the break like in your opinion at Kingfisher? Kingfisher is an epic spot. It’s 500m of flatwater before you reach various point breaks. Being on the north east tip of the Philippines means we get howling winds and waves pretty much always. We use 5m and 8m kites mostly. Swell can be anywhere from 1m to 6m. The breaks have their moments. However, there are plenty of times where the wave shuts down fairly quickly. Other times, it’s long and glassy open breakers. Honestly, I love this spot. On any given day, you need to adapt your riding to the conditions offered. From fast, burly short tubes to long vertical walls, it has it all. Another important point is that the spot is tide dependent, so you ride strapless on high tide and twin tip on low. Either way, you’re guaranteed super fun conditions. There’s no construction, buildings or houses anywhere, just wide open ocean, green mountains and the iconic windmill farms in the background. Ian Alldredge – How to Pop Shove it!